Another coaster joby in the locks at Tilbury. Loaded with oil drums etc. Another one for you RWJ. Probably a freight of ‘Lube’ oil from BP on the Isle of Grain, for discharge on to an outgoing larger vessel. There were many small coasters and barges coming into Tilbury Docks 40 plus years ago, and this is an interesting craft that is still afloat. 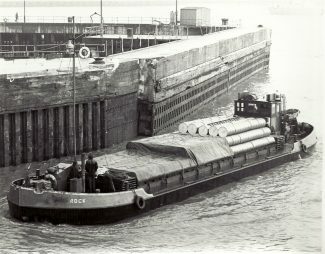 The motor coaster ROCK was one of nine identical ships built by Richard Dunston at Thorne, Yorkshire, in the earlier 1960, and ROCK dates from 1961. She is 27.4m in length and 6m wide, and when trading commercially, had a fully laden draught of a mere 1.4m. She was owned by London & Rochester Trading Co Ltd (Crescent Shipping), of Rochester, and like most of the other ships in the Crescent fleet her hull was painted a “pinkish red”. ROCK was sold by Crescent in the earlier 1980s and carried on cargo carrying for a few years under different owners, but in 1990 was taken out of Medway and Thames trading and took up charter work and latterly residential use. Still with its original name, ROCK is now moored at the Hermitage Community Moorings at Wapping, east London, where it is one of several vessels that are houseboats, or used for training, or charter work, etc. She is now owned by Anne Lydiat and Chris Wainwright and is a “residence”. The old pinkish red colour has gone and is now replaced by dark grey and black, and forward of the wheelhouse there is about 10 or 12 metres of low-level structure, below which is the residence. It seems that Anne and Chris are quite enthusiastic about their “home”, so ROCK could be around for a few years to come.